We've got a wealth of exciting tech news to treat you to today, courtesy of our friends at TechRadar. Find out just how close the robot revolution is, what's happening with the rumoured Google Pixel smartwatch, and how Elon Musk is transforming LA transportation. 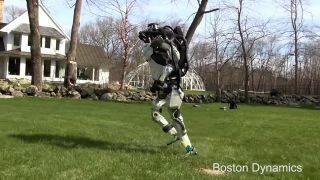 Either incredibly exciting or incredibly terrifying: Boston Dynamics has been showing off the latest developments with its family of robots, and the droid the company calls Atlas is now capable of taking a short jog across some rather uneven terrain. Click through to see the video in full, and marvel at how far this technology has come in a relatively short space of time – these bots could one day be essential in disaster and emergency situations. Hot off the rumour press is news that Google is planning to unveil a high-end Pixel smartwatch when it shows off the Pixel 3 phones later this year. We don't have many details on the Wear OS device just now, but apparently there might be as many as three different models in the works. The wearable or wearables will probably be sporting some new silicon from Qualcomm, which is busy working on updated smartwatch chips. Every day it feels like we're inching a little closer to the sci-fi worlds we see in the movies, and a lot of the time Elon Musk is responsible. The Tesla and SpaceX boss just announced that his subterranean, high-speed tunnel network in LA is just months away from completion, which means you'll be able to turn the rush hour into rush minutes. Musk is also going to offer free rides to selected members of the public to help launch the network. If you want to kit out your home with speakers that talk back to you, you've got a wealth of options to choose from at the moment. Add to that list the Polk Assist, which just got announced at the end of the Google I/O 2018 developer conference – it supports both Google Assistant and the Chromecast protocol, so you can beam audio over to it from your phone as well as ask it questions. It goes on sale in June in the US for $199 (about £150). Are you ready for more iPhones? The major 2018 batch of phones is expected to be unveiled in September, but before then we might see the iPhone SE 2 – and the latest rumours suggest it's going to bear a close resemblance to the iPhone X, with minimal bezels and a distinctive notch on the front display. That's according to leaked case designs, and the phone could appear as early as the Apple WWDC 2018 show in early June.